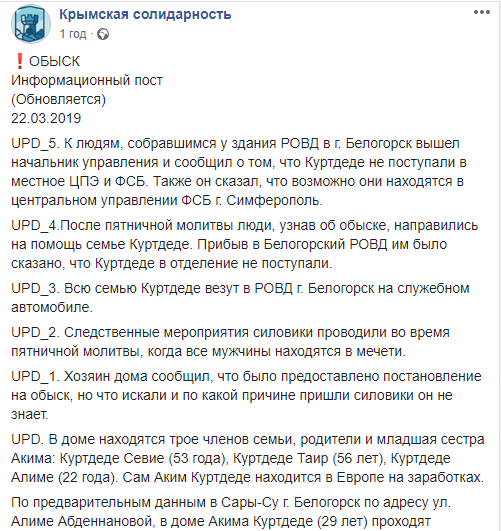 Today, on March 22, the house of the Crimean Tatar Akim Kurtdede were searched in Bilohirsk in the Russian occupied Crimea. Reportedly, the 29-year-old Kurtdede himself is currently in Europe for work, and at the time of the search his elderly parents and younger sister were staying in the house, according to public association Crimean Solidarity. The security forces showed a search warrant, but did not inform what they were looking for and for what reason they were conducting investigative actions. After the searches, all family members were taken away in an unknown direction. As relatives and friends of Kurtdede learned about the search, they came to the Bilohirsk District Department of Internal Affairs, but they were told that no detainees arrived. The response from the local “management” of the FSB was the same, but later it turned out that the head of the family, 56-year-old Tair Kurtdede, was kept there. Searches were conducted during the Friday prayer, when Muslims are in the mosque. After a few hours of searching, it became known that the security forces had released the Kurtddede family, and they all were returning to their home. The last searches in the annexed Crimea were held on February 14, 2019 in the village of Zhovtneve, Krasnogvardeysky district. FSB officers detained three Crimean Tatars — Rustem Emiruseinov, Arsen Abkhairov and Eskender Abdulhaniev. Soon they were arrested and attached a new “Red Guard group” to the “Hizb ut-Tahrir case”.